This is a tribute of sorts to “Uncle Ray Hall”, who wasn’t really my uncle, but a good friend of Dad, both of whom came from a tiny area in corn and oil field country, Indiana. Uncle Ray went on to become a Naval aircraft carrier aviator, while Dad became an officer in the Army, retiring as a full colonel, which, I can tell you, gave a whole new meaning to the yearly Army-Navy football games. That’s right. My sister, Pat, and I were Army Brats, but that’s not what this story is all about. Instead, this story is about how important people in one’s life have a way of slipping away from you in bits and pieces that are years until it is too late to tell them how important they really were. Uncle Ray should have become a cartoonist — he was that good, but I can appreciate that the thrill of being a 40s, 50s, and 60s pilot who launches his aircraft into a stiff headwind off the end of a carrier was much more exciting; Uncle Ray could have easily become an Indy race car driver, too. He loved the Indy 500. And he loved fast cars, because that’s the way most aviators are. Uncle Ray was the quintessential bachelor. I remember his fancy Alpha Romero sports cars, his sleek Jaguars, and other European screamers. A few weeks ago I received a letter from a close friend of Uncle Ray. 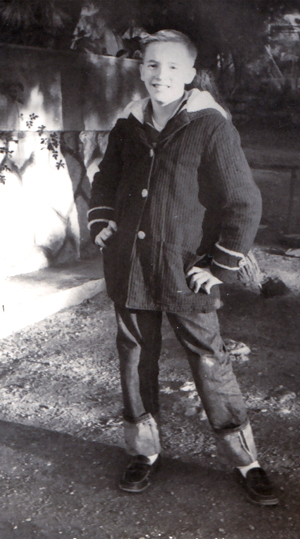 In it were several snapshots of my family, many of which I had never seen. The fact that Uncle Ray had held on to them all these years warmed my heart: maybe he got caught up in letting important people in his life slip away, too. One of only two photographs I’ve seen of Dad being truly relaxed. Most likely snapped during a commercial by Uncle Ray while watching an ARMY-NAVY game. Probably taken around 1965, because I recognize our Norfolk, Virginia “TV” room and the comfortable, half-eggshell padded chairs you could get lost in. This is the same room I watched every Twilight Zone, Man from U.N.C.L.E. and Avengers episode. I — like every TV-watching male teenager in the world — was in love with “Emma Peel“. Maybe it was the tight leather outfit she wore. The one with the ZIPPER running seductively down the front, the same zipper that had a KA-zillion teenage virtual fingerprints embedded all over it. Maybe. How about those rolled up Jeans legs? Can’t remember if that was STYLE or just Mom being frugal. White socks. Black shoes. An overcoat from hell. I actually WORE that stuff??!! A typical Thanksgiving Dinner, with Dad carving the turkey. 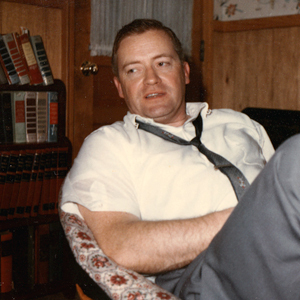 (The SECOND only picture of Dad I’ve seen with him looking relaxed.) That goofy kid front left is me. Still had red hair, but not as red as my sister, Pat, front right. Mom is behind Pat. She is now 93 years old. To the left of Dad is Claire. Uncle Ray’s lifelong “girlfriend”. Like Emma Peel, I had a crush on Claire back then. Back then I had a crush on almost every great-looking female I met. 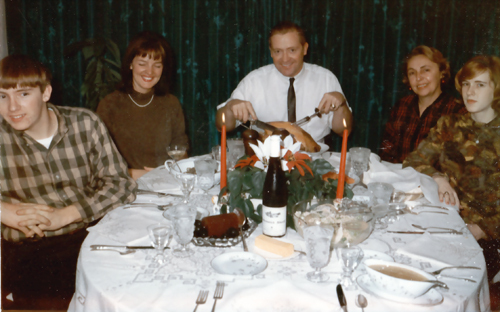 This Thanksgiving Day photograph intrigues me: the wine bottle label I can’t read, and the empty place setting where Uncle Ray was sitting moments before standing up and taking this picture. Thank you, Uncle Ray. I will miss you. I don’t remember much about my kindergarten year in Yokohama, Japan, but I do recall I enjoyed every minute of it. That’s where I played hooky for the first time (I went fishing), and that’s where I was served my first fish that still had its head on it. Minutes before the meal, I was lead to the restaurant’s indoor trout pond and waterfall, where I was given a bamboo pole with a dough ball neatly wrapped around a tiny hook. Three seconds after dipping the line in, I yanked a pan-sized trout out of the water. Zip, zang! The trout – – MY trout – – was clipped with a double, V-shaped identifying tail-notch. Flipping and flapping, the trout was quickly carried off into the restaurant’s steamy kitchen. Thanks, kid -- I see you! After a while, a waiter delivered the very same fish to our dining table. He pointed at the double, V-shaped tail-notch and grinned, but I was more interested in the fish’s head end, where a single, crispy-fried eyeball stared up at me from a bed of fluffy, white rice and lettuce. I fiddled with my chopsticks. I ate the fish, but had a difficult time keeping my eyes from wandering to Mom’s folded napkin. The trout’s nose was sticking out of a corner, and I knew the rest of the head was waiting for the napkin to slip just so it could sneak another peek at me. Soon, the meal was finished, the table cleared, and Mom’s napkin forgotten. Later that night I laid awake and thought about the trout. I think that was the first time I realized there was a difference between the fish I caught back home — the headless and anonymous kind that Grandpa cleaned when nobody was looking — and the more personal one I had yanked out of that Japanese Restaurant’s trout pond. No doubt, if I had been that fish, I, too, would want to stare at whomever was eating me. After Dad left the bedroom, I would usually drift off to sleep quickly, my mind anesthetized inside that soft, protective cloud of circular logic. One day Dad bought me a toy bow and arrow. It was the kind that had a blue and white pinstriped bowstring and several “safety” arrows capped with pink rubber suction cups. Yeah, right. It took me all of five minutes to remove the tips and sharpen the arrows on a rough patch of concrete. For hours I played with my new toy. By the end of the day there wasn’t a target in sight that didn’t have a hole or two punched in it. Well, Dad ignored me. To this day I don’t know why, but I shot my dad in the leg with my tiny, toy bow and arrow. Hey, Dad -- lookit ME! The arrow made a sickening squishing sound that I will NEVER forget. Needless to say my bow and arrow days were over.